Ultra light for ultra comfort. 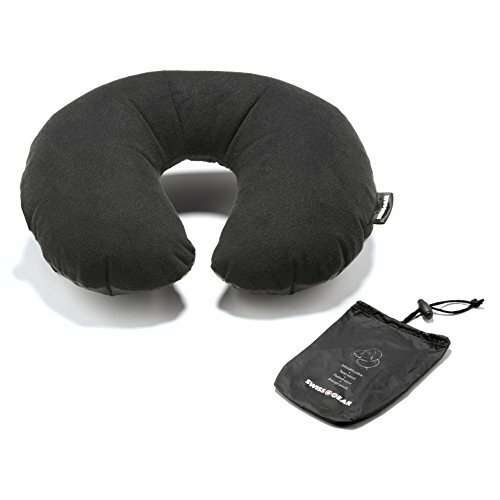 This travel neck pillow is so light you may forget it's there. Seriously! The feather-light inflatable core and soft cover conform to your head and neck, allowing you to find a perfectly comfortable position whether you're sitting completely upright or fully reclined. Pressure points are eliminated so you can achieve the kind of real rest and relaxation that's hard to find when traveling. Try it for yourself, and we think you'll agree this is the most comfortable inflatable neck pillow you've ever used. Softer than other inflatable travel pillows. With a microfiber cover on one side and silky nylon on the other, this blow-up pillow is indulgent no matter how you use it. And if you want to switch things up en route, it's easy to go from warm and soft to cool and smooth or vice versa with just a flip of the pillow. Adjusting the neck pillow's firmness is also quick and easy. Simply twist the quick-inflate valve to let air out or give a quick puff to firm things up. About SwissGear From the maker of the genuine Swiss Army Knife, SwissGear represents the best in travel accessories for people on the move. Our products make it easier and more comfortable to take what you need with you everywhere you go. So, no matter where life's adventures take you, always go with SwissGear. Our softest most comfortable inflatable neck pillow. Feather-light, quick-inflate air core provides adjustable comfort and support. Padded cover has soft microfiber on one side and silky ripstop nylon on the other. Twist nozzle makes travel pillow firmness easy to adjust and lock-in. Includes compact drawstring pouch for storage in your purse or carry-on bag.